This probably won't be the only post about nesting I write over the next couple of months. Today I'm exactly 32 weeks along and I'm thrilled to report that little Tigger will be evicted in less than 2 months. Nesting and a sense of shortened time have hit and I've made a huge list of things to get done before his arrival and Christmas. Today I'm going to share with you one of my favorite biscotti recipes. 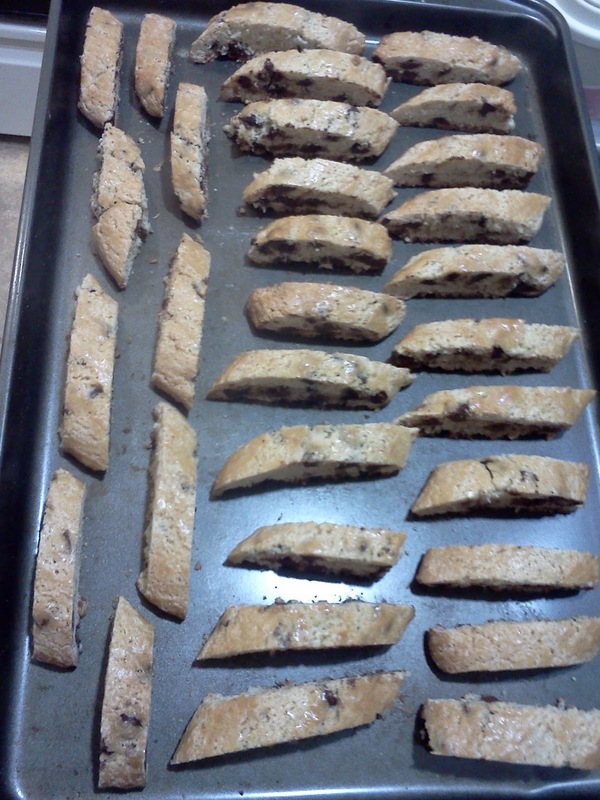 This Chocolate Chip Biscotti recipe comes from Good Housekeeping. I picked it because it is a simple recipe containing ingredients I always have around the house. I made them for the first time last year when I sent plates of treats to my husband's employees on Christmas. I made them again last night and was reminded how easy they are. They also freeze well. Preheat the oven to 350. In a large bowl, mix flour, sugar, baking powder, salt and cinnamon. Using a pastry blender or 2 knives, cut in butter until the mixture resembles fine crumbles. Don't fret too much about getting it perfectly distributed. Lightly beat the eggs and set aside about 1 Tbsp of it in another bowl. Add chocolate chips, vanilla and remaining eggs to the flour mixture. Stir until moistened - you might need to use your hands to get it mixed adequately if you aren't using a mixer. Regardless, with hands, knead mixture a few times in the bowl until a dough forms. On a floured surface, with floured hands, form four 9" by 2" logs and place them on one or two cookie sheets 4 inches apart. Brush egg over the top and sides of each log with the reserved egg. Bake logs for 25 minutes. Cool on the cookie sheet on a wire rack for 10 minutes. Place 1 log on a cutting board and with a serrated knife, cut the warm log diagonally into 1/2 inch thick slices. Place slices upright back on the cookie sheets. Slice all the logs this way and put them back in the oven for 15 minutes to dry out the slices. Cool completely on sheets on wire racks (they'll harden as they cool). Store biscotti in a tightly covered container or freeze. This morning I was more than a little groggy and was dreading getting out of bed until I remembered that I had these biscotti to dip in my coffee and that alone got me moving. They were heavenly! !